Bring on football baby! The 6 month wait is finally over. The NFL already has a few preseason games under its belt with 1 week left until the official season starts and kickoff to the college football season starts today. Its game time! I’m a Carolina Panther fan and I can’t wait to find out if the Panthers can redeem themselves and send the raining champs, the Denver Broncos running with their tails between their legs! They better…sorry Denver fans, I’ve gotta go with my home team!! We’ll find out on September 8th. And will the Crimson Tide start their season with a bang against the USC Trojans and keep up the momentum for a fifth championship title? We’ll see this weekend! There’s nothing more American than a great game of football. The Game brings friends and fans together, like no other, cheering in unison with pure excitement. This is where food comes in. Really. Good. Food. Fans don’t mess around when it comes to tailgating and home parties to watch the game! 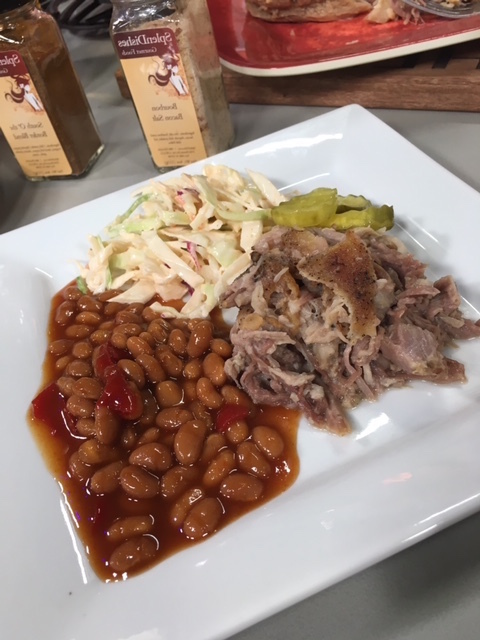 If you’re watching the game from home, you certainly don’t want to be in the kitchen while the game is going, and if you’re tailgating, you want to bring food that’s easy, but still delicious and of course impressive! I’ve got some good ideas for y’all, so get hungry! Whether you’re hanging’ in a parking lot or at the house, you can’t start a party without a cocktail. When it comes to football, an ice cold beer usually does it for me. But why not kick it up, a cocktail or 2 never hurt anyone. I don’t know a lot about mixed drinks, except how to drink them, so I did some research and found a really cool site that had a cocktail for every college team! A little extreme for me, so I’m going to keep it simple and roll with vodka. So many things you can do with vodka, mix it with lemonade, make bloody mary’s, and stir it in with some sweet tea. Here’s an idea, make a little bar area, and let your friends get their drink on. It’s about to get porkalicious in here. I’m all things pork. Bacon is my best friend, along with cheese. And wine. And I can make a mean pulled pork. 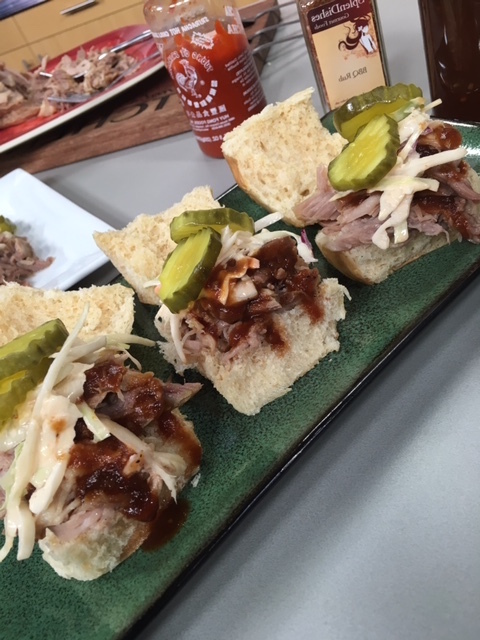 I do a lot of cooking on TV, and I recently did a segment on my Perfect Pulled Pork, 4 ways. So simple, and delicious and a great way to knock out 4 different tailgating ideas! 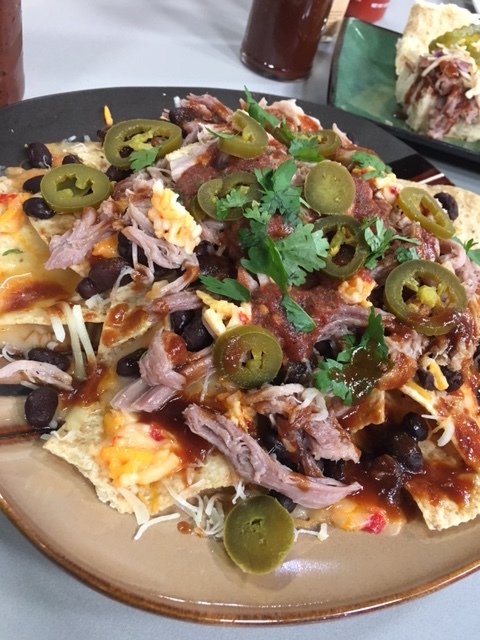 Pull off an impressive spread by grabbing a few condiments to knock out some amazing BBQ Pork Nachos, Street Tacos and BBQ Sliders. Put out some BBQ beans and make a quick coleslaw. It’s that easy! Place pork and onions in slow cooker. Season generously with SplenDishes House Blend and pour beer in. Liquid should be no more than half way up sides of meat. Place slow cooker on low and cook 8-10 hours. Carefully remove meat from pot and place on large platter. Using 2 forks, shred pork and keep refrigerated, in covered container until ready to use. 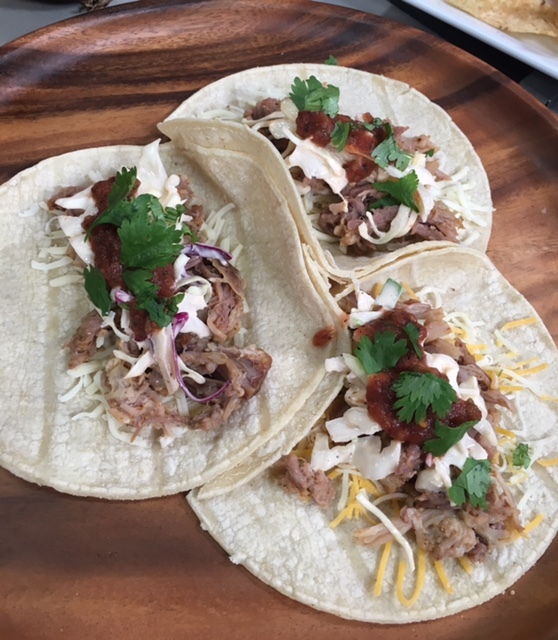 Use for BBQ Sliders, Street Tacos, and BBQ Pork Nachos or serve with beans and cole slaw! In a large bowl, whisk together mayonnaise, rice wine vinegar, House Blend and as much sriracha you like, until combined and smooth. Toss with cabbage until well combined. Keep covered in refrigerator until ready to use. Let’s take a small break from pork for a minute. Wait, what’s wrong with me?!? Fried Artichokes may not be pork related, but these crispy little bites of heaven, will have you asking for more. 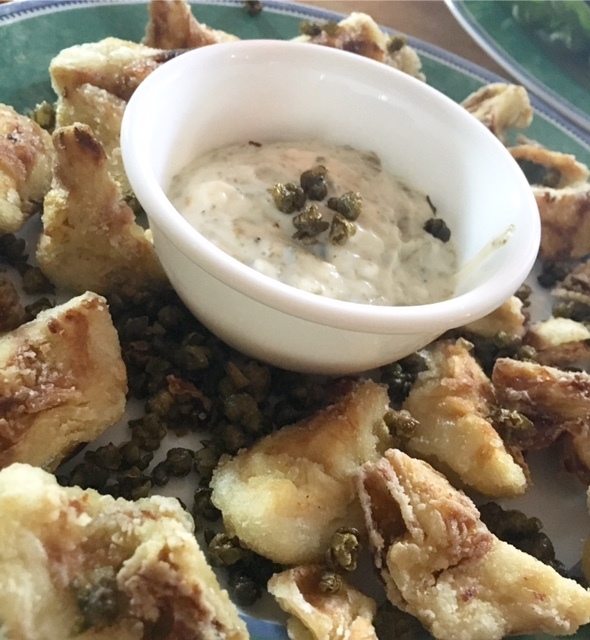 Garnished with crispy capers and a lemon garlic aioli to dip them in, I can’t get enough of them! Someone who said they didn’t like artichokes, tried one and then couldn’t stop eating them. They’re that good. These may be easier to make at a home party, it could get tricky, trying to get them to stay crispy during transport to your tailgating spot. But they can easily be made right before the game starts and stay crispy. To make aioli: In a small blender, combine mayo, garlic, lemon juice and 1 tablespoon of the capers, pulse, until blended. Place in bowl and refrigerate until needed. Drain artichokes in a colander, then place on paper towels and pat to dry. In a bowl, toss artichoke quarters in cornstarch and set aside. Heat oil in shallow pan until it reaches 365 degrees. Drop 2 tablespoons of the capers into the hot oil and fry until they stop sizzling, about 10-15 seconds. Remove with a slotted spoon and drain on paper towels. While oil is still hot (keep on heat), place 5 or 6 artichokes into oil, careful not to overcrowd the pan. Fry until golden brown on each side, about 4 or so minutes. Remove and drain on paper towels. Sprinkle immediately with bacon salt and repeat with remaining artichokes. To plate: Place bowl of aioli in center of platter and place fried artichokes around bowl. Sprinkle crispy capers over top and garnish with chopped parsley. Serves approximately 2-4 as an appetizer. OK, back on the bacon wagon, I feel normal again! 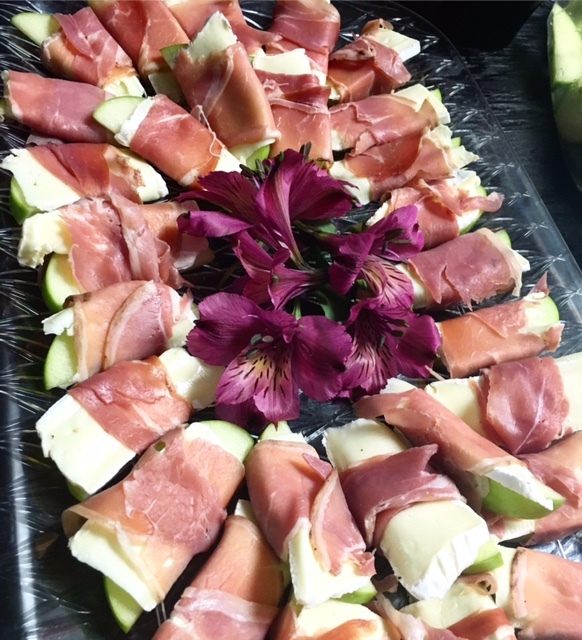 I’ve always loved the combo of a tart Granny Smith apple and creamy brie cheese, then I thought why not wrap them in salty prosciutto? You could wrap a flip flop in prosciutto and I would probably eat it. It’s the Umami of all bites. Umami, means “savory taste or decadent taste”. The ultimate in umami happening here, with tartness, creaminess and saltiness in one delicious bite. It may sound weird, but it works. Test your friend’s taste buds with these Prosciutto Wrapped Apple & Brie Wedges! Cut apples in half and remove core. Cut into 1/4’” slices and toss in a bowl with a splash of lemon juice (this prevents browning). Slice brie into similar sized slices as the apples. Pat apples dry with paper towel. Place a slice of brie on top of each apple and wrap with a thin piece of prosciutto. Arrange on platter and keep refrigerated until ready to serve. 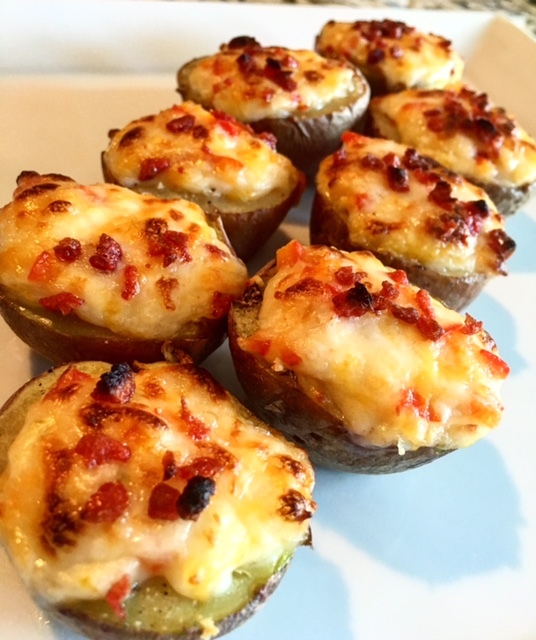 Who doesn’t like a loaded potato skin? I’m taking the skin to another level and making boats. Pimento Cheese & Bacon (duh) Boats to be exact. Buttery potatoes, creamy pimento cheese and crispy bacon. Seriously. Open mouth. Insert Potato Boat. Have adult moment. Drink beer. Repeat. Slice off a small piece of the top and bottom of each potato, so it has 2 flat spots on each end. Steam potatoes until fork tender, then let slightly cool. Carefully slice each potato in half, so each half can lay flat (on the end that was cut). Using a small spoon, carefully scoop out a small amount of potato, so there is a small area to hold the cheese. Fill each scooped out potato with pimento cheese and top with crumbled bacon. Place in broiler for 3-5 minutes, until cheese is lightly golden and melted. If you’ve recovered from all those adult moments, we have one last recipe for you. You can’t have a beautiful fall, game day without a big bowl of chili!! 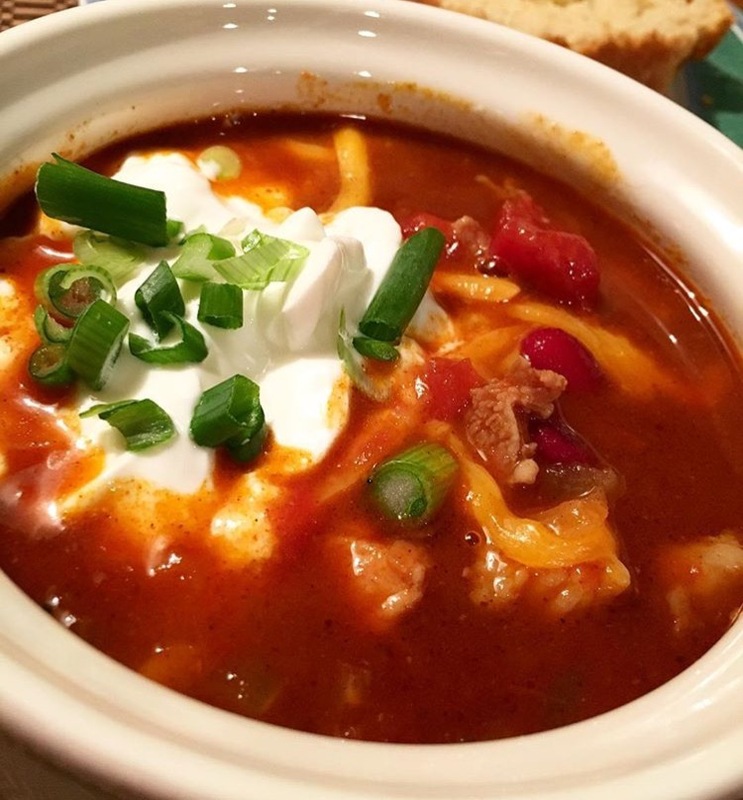 My Game Day Chili rocks because it’s made with 2 of my favorite ingredients, BEER and PORK. Feel free to change up your meat selection, but those chunks of juicy pork, give it so much more flavor. Make a big pot ahead of time, keep it warm in the crock pot and make a chili bar for your friends. Put out all your favorite toppings and let everyone make their favorite combo. Bowls of shredded cheddar, pepper jack and Monterey jack cheese, pickled jalapenos, sour cream (or Greek yogurt), sliced green onions and whatever else you like! In a large soup pot, add olive oil and sauté onions and garlic until tender, about 4 minutes. Stir in meat, breaking up with a spoon and cook about 5-6 minutes. Add chili powder, cumin and House Blend until combined. Stir in kidney beans, tomatoes, beer and water. Bring to a boil, then reduce heat and simmer for 45 minutes to an hour. Chili can also be transferred to a slow cooker, keep on low for about 4-6 hours. Set up condiments in small bowls and let guests make their own. Well, my fellow football foodies, it’s been real. I’m off to Bank of America Stadium in Charlotte, to watch the Carolina Panthers vs. Pittsburgh Steelers. GO PANTHERS! !